There are often times when a console operator would like to be able to stand in any place in a venue and change console settings. For HARMAN Studer Vista users, that dream is about to become reality. At NAB, Studer is unveiling its new Studer® Compact Remote Bay, a portable controller hardly larger than a laptop, but containing 12 motorized Penny & Giles faders and 40 rotary controls which link to a 19” touch-screen running Studer’s Virtual Vista software. This emulates the console’s Vistonics™ user interface. As well as remote operation the Compact Remote Bay may also be used to extend the main control surface for a second operator on large shows. It can also be used as a standalone controller for the Vista’s DSP core should the control surface not be available, with the provision of connections for local 5.1 monitoring and a headphone output. 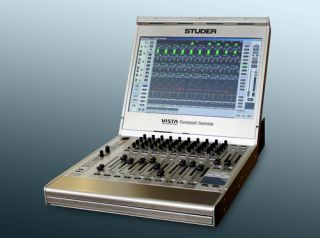 Other new products from Studer at NAB include the new Studer Vista 1 Compact mixing console, VISTA FX Lexicon engine, RTW TM7 Metering Option for Vista consoles integral EMBER control protocol and an Axia Livewire™ AoIP card for the D21m system.